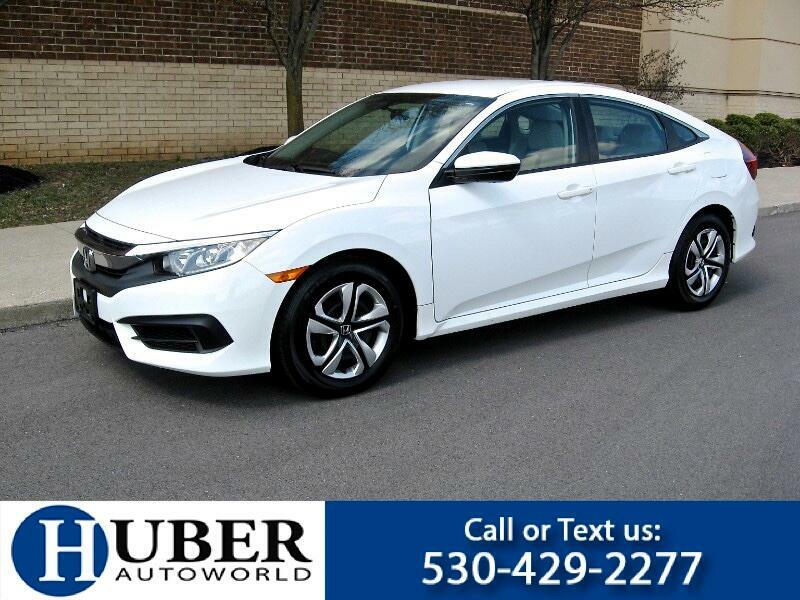 2016 Honda Civic LX -- 1 owner lease! Taffeta White exterior with Beige interior, 4 Brand New Radials, 2.0L I4 rated @ 41mpg, Eco mode, Automatic, Bluetooth, Backup Camera, Automatic Climate Control, Side Seat Airbags, Side Curtain Airbags front and rear, ABS brakes, Power Windows, Mirrors, and Locks, premium AM/FM/CD/MP3/AUX input stereo with hands free controls, Keyless entry! AutoCheck certified! Just serviced and inspected! Full Factory Warranty through 05-06-19 or 36,000 miles, Factory Powertrain Warranty through 05-06-21 or 60,000 miles. 10 year / 125,000 mile extended warranty available. COMPARE OUR VEHICLE QUALITY, MILES, AND PRICE! 10-15 Honda's in stock. Specializing in quality 1 owner lease turn ins. Call or text 530-429-2277, online at huberautoworld.com or visit Huber Autoworld on 3088 Lexington Road, Nicholasville KY.